That’s what I want to say to my children when they turn their noses up at my hard work and healthy food options. They really have no idea how good they have it. None of us do, really. We are all incredibly blessed with the food options we have – even if our budgets do keep us from expanding beyond some lower cost real food basics. Blessed! Blessed! Blessed! It’s easy to get frustrated when we work hard in the kitchen to put good food on the table and we are greeted by grumbling. It’s discouraging when we know the importance of healthy eating and our family asks for hotdogs and Cheetos. I definitely don’t have all the answers for you when it comes to picky kids or husbands. Very few people in the world will “eat anything you put in front of them.” That’s okay, right? God made us all different, with different tastes and preferences. Just like anything, we need God’s help to help us on this real food journey. Pray for God to help you as you make decisions and encourage your family to eat well. Let God do His work in this. He’s amazing. He’ll continue to prove it to you. Praise Him when your picky child eventually eagerly gobbles down his veggies. It will happen! If you give in every time you hear a complaint, you’ll be throwing out the good food without helping anyone give it a fair chance. It takes time to get our taste preferences and cravings past food filled with MSG and artificial ingredients. Real food does taste different. It tastes better, of course, but if a person is used to high sodium, flavor enhanced “food,” getting used to and learning to love real food does take some time. Introduce new, real foods slowly. A carrot here, a smoothie there, real cheese for a snack instead of processed – they’ll get there. God will help. One trick that has helped our family in the transition to eating real food is sticking with fun, kid friendly, favorite foods (like pizza, chicken nuggets, and tacos) – but making them with healthy ingredients. It keeps us from feeling “deprived,” it makes hospitality easier, it tastes delicious. Want some tips to help you recreate your favorite recipes into healthy foods? Read this post on How to Adapt a Recipe to Make it Healthier. Also, you may find the following downloadable chart helpful. If a recipe calls for_____________, use ________________. Healthy recipe substitutions are much easier than you think! 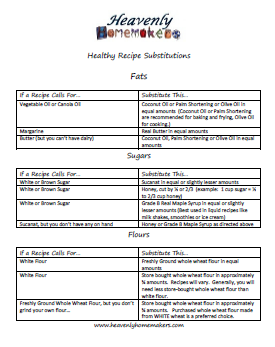 Download and print the Healthy Recipe Substitutions chart to help you as you adapt recipes! How do you help transition picky eaters at your house? It also helped to have one thing that I knew he loved at every meal, so he would at least eat that, along with one bite of everything else. I never gave him any options, except what I served, and there were evenings he decided not to eat anything. I would tell him that if he changed his mind a little later, I would be happy to warm his dinner for him. Sometimes he would decide to eat it a little later, but sometimes he went to bed hungry, and ate a huge breakfast the next morning. I used those mornings as a chance to discuss why it’s important to eat dinner. I do give my children a bedtime snack, something small like a piece of fruit, a piece of bread, butter and jam, a few dried cranberries, etc. But they know if they choose not to eat any dinner, there will be no bedtime snack. Sorry this is so long, but I hope the ideas help. I always presented it to him as it’s my job as the mom to decide what foods to serve, and it’s his job to decide to eat it or not. But if not, nothing else, and no snacks. Good luck! My motto is I don’t bring anything into the house I forbid my kids to eat, so that means if I buy a tube of Pringles, they are fair game! My kids gobble that junk down, but I buy it in extreme moderation as a “treat” and I explain to the kids how expensive the junk is both in terms of $$ and empty nutritionless calories. I overheard my 11yo son tell a friend recently that cooking from scratch is much healthier and whole foods make a healthy body (I chuckled to myself — he really IS listening!). We have a tub of Nutella and a bag of Lay’s in the pantry at the moment, but those are truly “party” foods. My 14yo had Jif at a friend’s house recently and he couldn’t figure out what was “off” about it (I make my own peanut butter out of…wait for it…just peanuts!). So, I think just telling them over and over again WHY we eat healthy finally just sinks in. I guess I have it lucky that my child is only 8 months old – we can get him on the right path from the get-go. But I model my attitude after my own mom. She had six kids and was not about to cook six different plates for each meal! Lisa J. commented on “being the boss” and that’s really what my folks did. Sometimes I think younger parents are too afraid of being insistent with their kids. In our house Mom cooked it, we ate it and that was that. We were all members of the clean plate club whether we wanted to be or not. Wasting food was the 8th Deadly Sin in our house. My mom’s best strategy though was that we had to have at least a No Thank-You Helping which was three forkfuls. Really, it will not kill your kid to choke down three forkfuls of something they don’t like. Her 2nd best strategy was variety. Maybe your kid doesn’t like cooked carrots but will eat them raw with dip. Maybe they don’t like fried potatoes but they like them mashed. Experimenting with different condiments or herbs/spices works too. Sometimes it’s not the food item itself but the texture or temperature that turns us off so keep offering good foods but in different ways. Great post! It pains me as well when my kids grumble about the sub par quality of winter produce. Seriously, I spend a mint on a LARGE variety of fresh produce every week. I want to lecture my children about how store bought grapes were so rare at my house growing up we actually got them in our Christmas stockings as a treat! Instead, I remind them they can leave the offending fruit or veggie on their dinner plates, but they won’t be getting anything else. So, I guess I deal with picky eaters by having a large variety of produce and rotating through it during the week. In my oldest daughter’s school lunch, I stick to fruits and veggies I know she loves/travel well . For dinner I serve at least 1 veggie all 3 girls love. Though, the second veggie might not be everyone’s favorite. I make an effort to serve veggies and fruit multiple times, multiple ways and if a child truly doesn’t like it, I don’t make them eat it. My middle child has had avocado plain and in things since she was a baby and just doesn’t like it. So I offer it, but give her an alternative if she doesn’t want it. Green beans on the other hand, are not her favorite, but she will eat them, so I put a small scoop on her plate. If my children don’t like everything in the main dish, I encourage them to eat the parts they do like. I never force my kids to finish their food, but they also know they won’t get anything else until breakfast the next morning. I figure it is only 1 meal and it will balance itself out over the course of the week. We also try to avoid snacking in-between meals so my kids are usually hungry at mealtimes. My 2 year old used to eat everything, but a few months ago he started asserting his will at the dinner table. I just continued to offer and offer and didn’t make a big deal about it. Fortunately he loves carrots and peas, so I started using those foods to get him to eat others. I started offering a pea or slice of carrot only after he ate a piece of what I wanted him to eat, and continued alternating. It worked! Now and then he spits something out and I figure he may really dislike that and let it go, but he almost always eats what I want him to and gets his peas/carrots. Win–win! Some of the new foods I got him to try are now bargaining foods instead of just peas and carrots. Yay! At 4, I think he is old enough to be learning about nutrition and so we talk about how different foods have different nutrients and he needs a little bit of everything to grow healthy and strong. It is simply the norm that he needs to pick a veggie to go with lunch, and that if he chooses not to eat what is served for dinner he doesn’t get to have something else. He tends to not like things all together, so for example instead of a salad, he will get a few pieces of lettuce, a couple tomatoes, some carrot slices, etc. all separate on his plate, and then dip them separately into some dressing- so don’t be afraid to keep presenting things in different ways! Pepsi with organic salad..sounds familiar. Anyway, thanks for the encouragement. I’m going to keep plugging away a little at a time. My family pretty much balked at brown rice tonight but they ate the whole wheat past last week so go figure. I just made your raspberry oatmeal bars and they are soo good. I didn’t have any sucanat or preserves without sugar so I just used brown sugar and apricot jam – baby steps… I also used a mixture of whole wheat flour and whole wheat pastry flour. They are so tasty! I really appreciate all your help with this “whole/real food” topic! I really appreciate your advice to seek The Lord with the challenges that come along with trying to feed our families healthy foods. It really helps to put my mind into the right perspective when I remember that it is not MY work anyway. It is truly a challenge – especially if it is a change from what they have previously known. 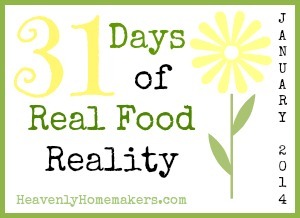 Through the years of our journey to eating “real food”, I have nearly given up more than once. But, perseverance will pay off. Just last week we had to run out of the house for one of the boys’ drum lessons – we were running late. Some of the children had eaten, some had not, some were still eating… I had not even had time to make a breakfast for myself so I grabbed a cup of commercial yogurt out of the refrigerator along with some baby carrots and hummus I had made the day before. Yes, it was a strange combination, but it would do until lunch. As we sat in the van doing our schoolwork waiting for their older brother to finish lessons, my youngest children (who had packed up and brought along their biscuits from home), became very interested in my “breakfast”. They eliminated the entire bag of carrots and nearly wiped out the hummus! I wondered to myself if they would have enjoyed it as much if we were at home with much more to choose from. Bottom line: I learned that with nothing else to choose from, a snack they might have otherwise passed over, became a delicious treat for them. @ Karen- that was an encouraging story. Thanks for sharing.